The Duchess dazzled when she stepped out wearing one of Diana's most precious heirlooms. All eyes were on Duchess Catherine and Prince William when they stepped out at the 2019 BAFTA Awards in London overnight. The Duke and Duchess of Cambridge cut a glamorous figure as they arrived at the Royal Albert Hall on Sunday, January 10th for the star-studded affair. But it was Duchess Catherine's glittering accessories that well and truly stole the show. The 37-year-old added a very sentimental touch to her white asymmetrical gown, designed by Sarah Burton for Alexander McQueen, by wearing her late mother-in-law Princess Diana's stunning diamond-encrusted pearl-drop earrings. With her brunette tresses swept up in a classic chignon style, Diana's sparkling accessories shone bright as Kate walked the red carpet. 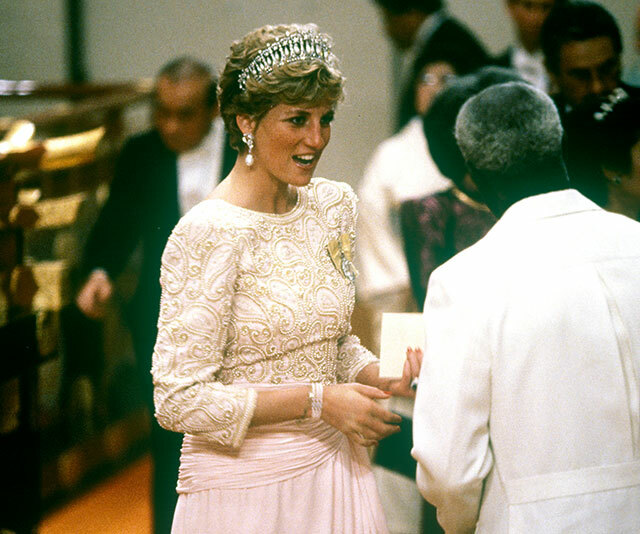 Before her untimely passing in 1997, the Princess of Wales wore the priceless jewels to several high-profile events, most notably when she met the Emperor of Japan Akihito in November 1990. In a full circle moment, Diana also wore the earrings when she attended an event at Royal Albert Hall in 1991 - the same location where the BAFTAs are held. Both Duchess Catherine and Duchess Meghan have inherited several items from Diana's jewellery collection and it's always a joy when we see the ladies pay tribute to their mother-in-law. Most famously, Kate's deep-blue sapphire engagement ring previously belonged to Princess Diana. The mother-of-three has also worn Diana's Cambridge Lover's Knot tiara on several occasions for state banquets. While Meghan's engagement ring from Princess Harry features two diamonds the Princess's private jewellery collection. The BAFTAs have long been a glamorous stomping ground for the British Royals and with Prince William the current president of the association, the royal presented the Fellowship award at this year's ceremony.